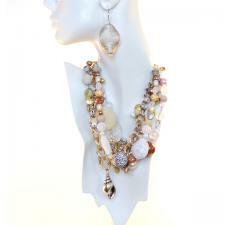 Hamptons necklace, OTF5-24, Hookster® by MS V Designs™, Five strand versatile fashion necklace. With the Hookster®, Experience the Value of Versatility, Exclusively from Ms V. Your Belt, Necklace, and Bracelet All In One!™Tones of silver, white, clear, gold and black added to coastal shapes. Excellent to combine with all outfits for a summery tropical touch or cashmere whites for your winter nights.